So off we set on Sunday 15th April from Co. Wexford at 4am to Dublin Airport for the 7.10am flight to Liverpool John Lennon Airport, myself Himself (Fran) and an APC (St 4 Coach) Tara Sweeney BHSII. Arriving in Liverpool our first stop was the Anglican Cathedral which is the largest Church of England Cathedral in the UK if not the world. Built between 1910 and 1968 it is awesome as is the music from the organ and the choir who were very much in evidence for the 10.30am Eucharist Service. And this set the scene for the following two days of stimulation, inspiration, amazement, education and sheer joy of being part of the F&I Association and BHS. Day One concentrated on ‘Coaching the Rider’. Christoph Hess took us through ‘Training the rider to ride into the contact’ and with three riders he very much involved the audience as he helped us to see that “The horse is a mirror of the rider” “the rider produces the horse and so the better the feeling the better the rider can produce the horse”. 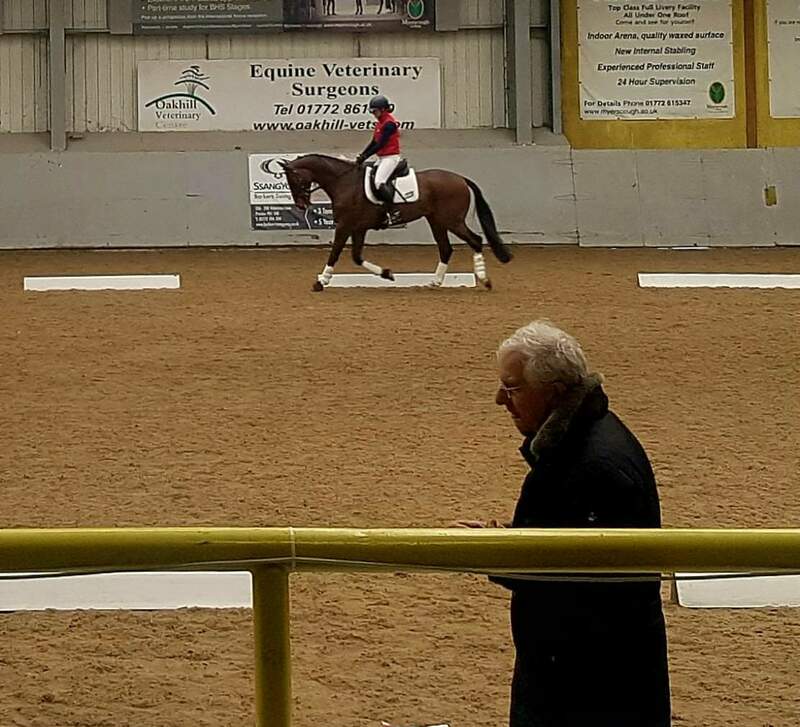 “Look positively at the combination think like the dressage judge who should start at 10.0 NOT 1.0.” there were so many gems to be learnt from Christoph I shall be using lots of inverted commas, maybe the best one was the one for Carrie on Day Two “Top Class” however, back to Day 1. Christoph emphasised that the horse must react to the rider’s leg and so be in front of the rider’s leg, “Horses need clear advice.” “The more influence the rider has the more obedient the horse will be”. He worked each rider and discussed each rider with us giving us the tools to help those riders and horses, and they were riders with horses so many of us work with – the local Riding Club lady, the local Preliminary – Elementary competitor. Sam York FBHS Sam has a list of credentials many of us would like to have achieved, not least last year the Fellowship and she’s, a very active member of the F&I Association’s Committee. 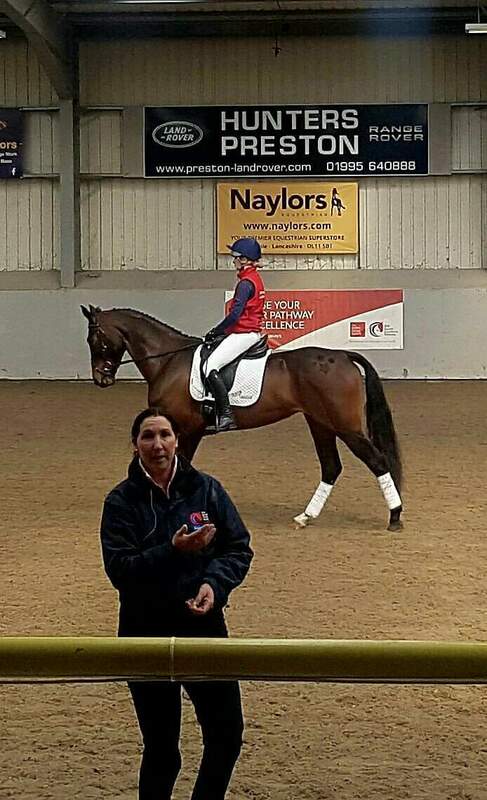 It has long been known to a lot of us that Sam is interested in the science and technology of how we as riders ride our horses, how we as Coaches coach our riders but also how the horse disseminates all this information we expect him to understand. So, Day One was to show us three pieces of equipment/gadgets to help us to find evidence to show that what we say as coaches is then backed by scientific statistics. HMMMM I hear you say – yes me too BUT it was amazing to see these three young people on very smart horses show us these gadgets. 1) the Equla Vert, the gadget Sam showed us at the F&I Course in January was now in action. Attached to the top plait this small device can show the rider when the horse’s head is too high – red light- too low – blue light – and correct – green light. 2) a set of reins with an insert of red elastic which shows just how much ‘pull’ there is on the reins as redder = more pull whether from the horse or rider. 3) a pair of large glasses on our third rider monitored the rider’s point of gaze (POG) this information is then recorded and we could see where the rider was focussed as she approached the fences. Much discussion took place as to where the show jumper will be looking – top of the top rail compared to the eventer who will be looking ‘around’, to the next fence, dogs /children on the course, the going in front of the next fence. All so interesting, I’m a convert. In my own small way, I will be doing more of Sam’s suggestion which is to video my pupils (well Fran will do the camera work) and then give them instant feed-back. 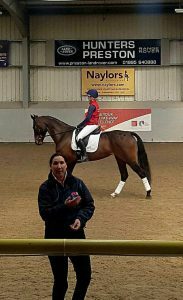 Chris Bartle Day One, Chris worked with four riders on four smart horses at lower levels of competition work – a Myerscough horse, a re-trained racehorse, a pre- Grass Roots BE horse and a BE 100 horse. Again, I shall quote some of Chris’ own phrases hoping to give you a flavour of what I learnt. 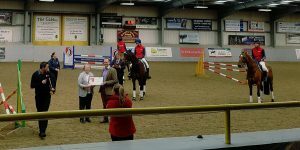 There was audience participation as Chris worked the riders over poles building up to ‘An introduction to the use of grids for training the horse and rider.’ “Balance and impulsion when jumping give your horse more options” Chris emphasised the rider’s body posture and position before, over and on landing after a fence, how we impede or help the horse. The horse should “step into canter” from the balanced trot and this is where the rider needs to be aware of their own body positioning. We should be sure that our pupils look up and ahead keeping the upper body still over the fence with the hands down so as not to pull from the arms. “The effective rider allows the horse to use his own initiative by maintaining his own balance and posture” There was further discussion on stirrup length and saddles so the taller rider with the longer thigh had enough forward cut on the saddle to accommodate his thigh. It was so refreshing to see the riders and horses work down the grid as Chris progressively built it up. There was one little horse who, I believe, is ridden by many riders who just gave up towards the end having, seemingly, been rather overwhelmed by the exercise. This gave us much positive discussion as to how to help the horse and rider. And then the piece de resistance Chris Coached Alex Hua Tian in an ‘Elite Coach/Rider Demonstration” There are no words to describe this, it was magnificent. Barton Grange Hotel was very pleasant and the Gala Dinner fun, Bob Champion told his life story and those of us old enough could remember the horses he had ridden and the various trainers he had worked with. “Age doesn’t come on its own”!! Then the questions time started with “What does one do when one’s partner is besotted by horses” over to Sam for that one. Day Two was ‘Training The Horse’, we started with Chris with four different more experienced riders and horses, with the theme “Less than straight-forward fences.” Position of the rider played a big part here with discussions on body language of the rider, the use of running martingales, the action of different bits on the horse going cross country and the ability of the rider to bridge the reins. 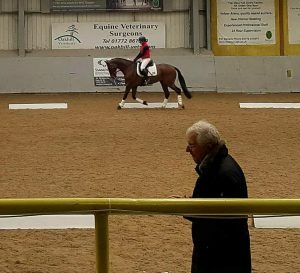 The track Chris had designed in the indoor arena at Myerscough embraced just about every type of fence you would meet in a simulated XC session, how to build up to a skinny, a corner, across a fence and more. “Let the horse jump away from you.” “Keep the body still and look at the second fence.” “Find the line, find the fence” “Don’t throw your body forward – put your hands to bed” “Allow the horse to poke the nose and find the line, stay upright and let the neck away” So much information, riders and horses going from strength to strength, wonderful. 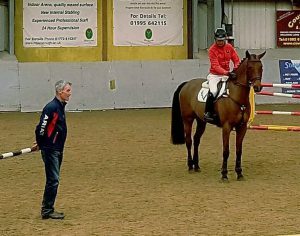 Sam then used her pupils to continue the theme of “Equestrian Coaching in the 21st Century.” Sam concentrated on what the horse was seeing although there are as yet no statistics to PROVE what horses see. So, cross country courses are walked by the rider more than once and we are all aware that on the first walk we are seeing those fences as, possibly, our horses see them. A most interesting demo as we watched these talented young riders ride the exercises Sam had put out for them and we concentrated on watching the horses’ heads, ears and eyes. 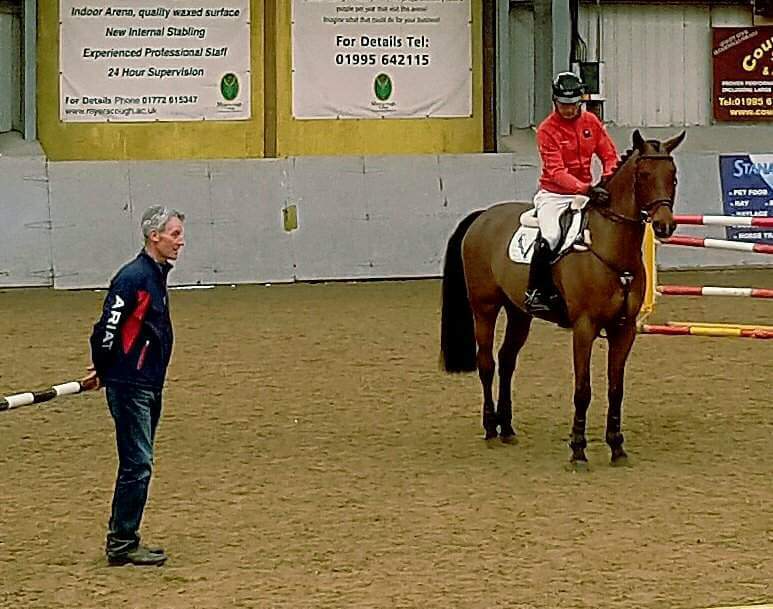 “The Coaches role is to educate the riders to train the horses”. Thanks Sam I shall be very mindful of those words. And there, dear reader we had to leave to catch the flight home so, sadly, we missed Christoph’s final rider and his Elite Horse Demonstration with David Sheerin. BUT what a fantastic way to gain the CPD points needed for the APC and its tax deductible!!! 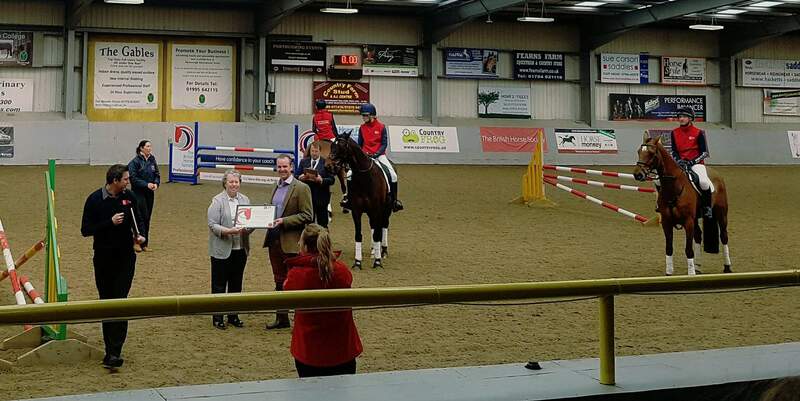 ← BHS International Convention 2018 – Hartpury.